Push the “INFO” button to display the“Information Menu” screen. Trip information: The energy monitor andfuel consumption screen are selected. Language: Select language screen isshown. Screen setting: The screen setting screenis shown. Touch the “Energy” switch. Vehicle drivingcondition, hybrid system operating conditionand energy recovery condition areshown. 1. Indicates the flow of energy by orangeand yellow arrows. While the energy isrecovered, the arrows change thepointing direction and turn green. 2. 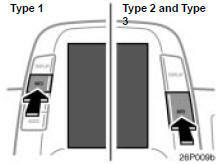 Indicates the remaining capacity of thehybrid battery. The screen display updates every 3 seconds,so it may not coincide with theactual status. Touch the “Consumption” switch. Averagefuel consumption, momentary fuel consumptionand recovered energy areshown. 1. Indicates the past momentary fuel consumptionevery 5 minutes. 2. Indicates the energy recovered for 5minutes with symbols. One symbol refersto 50 Wh or the energy by whicha 50 W bulb illuminates for an hour.Up to 4 symbols will be shown. 3. Indicates the current momentary fuelconsumption. 4. Indicates the average fuel consumptionafter being reset. When the “Reset”switch is touched or more than 10 L(2.6 gal., 2.2 Imp.gal.) fuel is supplied,the average fuel consumption is reset. The trip information screen appears directlyby pressing the “INFO” button on theright side of the steering pad. Each presschanges the “Energy Monitor” and “Consumption”screens alternately. You can select the language shown onthe screen. Touch your desired switchon the screen. The function returning to the previousscreen from the audio or air conditionerscreen is selectable. Select “ON” or“OFF” and then touch “OK”. ON: The previous screen automatically returnsfrom the audio or air conditionerscreen 20 seconds after the endof audio or air conditioner screen operation. OFF:The audio or air conditioner screenremains on. Select the desired switch color andtouch “OK”. This function is available only when thevehicle is not moving. 1. Touch “Delete personal data”. The “Delete personal data” screen appears. The “Confirmation for deleting all personaldata” screen appears. Select the desired background colorand touch “OK”.